Objective—To quantify the prevalence of osteoarthritis and the severity of pain in the lower limb joints of players retired from English professional soccer. Method—An anonymous self administered questionnaire was distributed to 500 former players registered with the English Professional Footballers' Association. The questionnaire was designed to gather information on personal details, physical activity loading patterns, history of lower limb joint injury, and current medical condition of the lower limb joints. Results—Of 500 questionnaires distributed, 185 (37%) were returned. Nearly half of the respondents (79: 47%) retired because of injury; 42% (33) were acute injuries and 58% (46) chronic injuries. Most of the acute injuries that led to early retirement were of the knee (15: 46%), followed by the ankle (7: 21%) and lower back (5: 15%). Most of the chronic injuries that led to early retirement were also of the knee (17: 37%), followed by the lower back (10: 22%) and the hip (4: 9%). Of all respondents, 32% (59) had been medically diagnosed with osteoarthritis in at least one of the lower limb joints. More respondents had been diagnosed with osteoarthritis in the knee joints than either the ankle or the hip joints. Significantly (p<0.001) more respondents reported pain in one lower extremity joint during one or more daily activities than those who did not (joint pain: 137, 80%; no joint pain: 35, 20%). Conclusion—The risk for professional soccer players of osteoarthritis in at least one of the lower extremity joints is very high and significantly greater than for the general population. The results support the suggestion that professional soccer players should be provided with health surveillance during their playing career. The risk of work related osteoarthritis in the lower limb joints of retired professional soccer players is significantly higher than in the general population. The evidence indicates that players should be provided with health surveillance during their playing careers to identify the onset of this problem and to minimise the long term health risks. There is a general requirement under legislation in the United Kingdom for employers to protect employees from any risks to their health and safety.1 Of particular importance is the specific requirement for employers to provide health surveillance to employees where significant risks to their health have been identified.2 The key elements in determining if health surveillance is required are whether an identifiable adverse health condition that is directly related to the work exists and whether there is a reasonable likelihood that the effect may occur under the conditions of the work. The major chronic injury suffered by professional soccer players has been reported5 to be osteoarthritis (OA). Compared with control groups, a higher prevalence of OA has been reported for former amateur and professional soccer players in the ankle,6,7 knee,8–11 and hip12–14 joints. Despite this evidence, the UK Industrial Injuries Advisory Council (IIAC)15 dismissed calls for OA of the knee resulting from participation in professional soccer to be included in the Industrial Injuries Scheme under the Contributions and Benefits Act (1992). Osteoarthritis of the hip resulting from participation in professional sport is currently under consideration by the IIAC for inclusion as an industrial injury, but, until stronger evidence has been published, it is unlikely that this condition will be included either. The method adopted for data collection was an anonymous self administered postal questionnaire based on established published knowledge and criteria for assessing the causes, presence, and severity of OA. The questionnaire consisted of four broad sections designed to accrue information on personal details, physical activity loading patterns, history of lower limb joint injury, and current medical condition of lower limb joints. Each of these sections within the questionnaire was divided into a number of subsections. Respondents were asked to provide the dates at which the following events occurred: birth, first official schoolboy game, first professional contract, and retirement from professional soccer. Details were also recorded for the highest playing levels achieved and major playing position (goalkeeper, defender, midfielder, forward). Players were requested to identify the main reason for their retirement from professional soccer. Players were asked to identify the number of moderate and major injuries received as a consequence of playing professional soccer to the lower limb joints (hip, knee, and ankle). The injury severity definitions of “moderate” (absent from training/competition for one week to one month) and “major” (absent from training/competition for more than one month) were the same as those used previously to categorise acute injuries in professional soccer.4 Data were also obtained on age at the time of surgery and when a medical specialist first officially diagnosed OA for each joint. This section requested information on current joint function and level of joint pain during a range of static (sleeping, rising from bed, sitting, standing) and dynamic (walking up/down stairs, walking over 1 km, and squatting/bending forward) daily activities. Kujala et al,14,16 Raty et al,17 and Lequesne and Samson18 used this range of activities previously in studies of OA, and Lequesne and Samson18 used and validated the intensity of pain scale (nil, minor, moderate, severe, and very severe) previously in a study of OA. The survey was distributed to 500 former professional soccer players registered with the English Professional Footballers' Association (PFA). It was accompanied by a supporting letter of explanation, signed by the Chief Executive of the PFA, and a prepaid reply envelope. All statistical analyses were carried out using the Statistical Package for the Social Sciences version 9.0 (SPSS Inc, Chicago, Illinois, USA) for Windows computer package. Statistical significance was accepted at the p<0.05 level, unless stated otherwise. Where appropriate, values are reported as a mean (SD) (range). Categorical data were assessed by a cross tabulation method using exact χ2 tests. For all ratio data, analysis of variance for independent samples was used when the Levene test for homogeneity of variance was not significant. If the test for homogeneity of variance was significant, and the largest variance in each group did not correspond to the largest number of variables per group, Kruskal-Wallis H tests for three or more unrelated groups were used. A post hoc Tukey test was used to identify specific differences for all parametric tests. A weighted average pain score was calculated for each joint based on the level of pain reported (nil, 0; minor, 1; moderate, 2; severe, 3; very severe, 4) and the number of respondents reporting each level of pain. Of the 500 questionnaires distributed to former professional footballers, 185 (37%) were returned. The mean age of the respondents was 47.6 (13.2) (20–84) years. The mean age at which the respondents reached the specified playing milestones were: first competitive schoolboy game, 10.4 (2.4) (4–16) years; signed first professional contract, 18.2 (2.4) (16–27) years; retired from playing professional soccer, 32.5 (5.2) (17–42) years. Respondents played, on average, for 4.1 (2.0) professional clubs during their soccer career. For those respondents who identified a preference, 71% (127) were right foot dominant, 21% (37) were left foot dominant, and 9% (16) were ambidextrous. There were significant differences in the distribution of players as a function of the highest level of achievement (International, 64 (36%); Premier League (and old First Division), 73 (41%); First Division (and old Second Division), 21 (12%); Second Division (and old Third Division), 10 (6%); Third Division (and old Fourth Division), 10 (6%); p<0.001). There were significant differences (p<0.001) in the numbers of respondents by playing position (goalkeeper, 12 (7%); defender, 51 (28%); midfielder, 58 (32%); forward, 59 (33%); p<0.001). However, there was no significant difference between the expected numbers of respondents in each playing position based on a standard 1:4:4:2 team playing formation. Of those respondents expressing a reason, nearly half reported that they had retired from soccer because of injury (79: 47%), 33 (42%) because of an acute injury and 46 (58%) because of a chronic injury. Table 1 shows mean weekly exposures to training as a function of career stage and type of training. There were significant (p<0.001) differences in exposure for endurance, power, and football specific training, with the average exposures for all types of training being significantly (p<0.001) greater during the professional career stage than for the schoolboy and retired career stages. 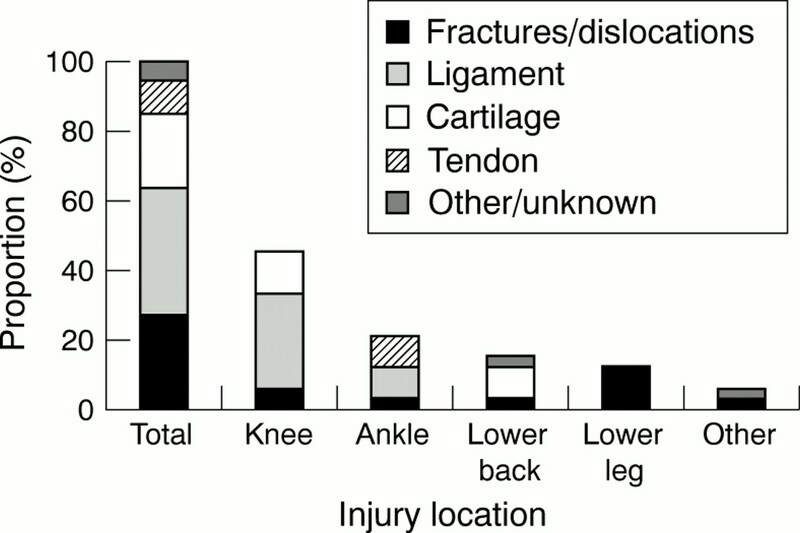 Figure 1 shows the location and nature of the 33 career ending acute injuries, for which there were significant differences, as a function of both injury nature and injury location (p<0.01). The knee was the location of most of the career ending acute injuries (15: 46%) followed by the ankle (7: 21%), lower back (5: 15%), and lower leg (4: 12%). Damage to ligament structures (12: 36%), bones through fractures and dislocations (9: 27%), and cartilage (7: 21%) accounted for most of the acute injuries as a function of injury nature. Location and nature of career ending acute injuries. Figure 2 shows the location and nature of the 46 career ending chronic injuries. There was a significant difference in the number of injuries as a function of injury location (knee, 17 (37%); lower back, 10 (22%); hip, 4 (9%); ankle, 3 (7%); p<0.001) but not for injury nature (cartilage, 4 (9%); bone, 3 (7%); tendon, 3 (7%)). However, many of the respondents (35: 76%) were unable to identify the exact nature of their chronic injury. Location and nature of career ending chronic injuries. Table 2 provides a summary of the injury history of the respondents. Significantly more respondents had received moderate (p<0.001) and major (p<0.001) injuries to the ankle and knee joints than to the hip joints. The numbers of moderate injuries to the ankles were also significantly greater than the numbers of moderate injuries to the knees (p<0.01). There were no significant differences in age, as a function of joint location, at first surgical treatment and initial OA diagnosis. However, there was a significant difference (p<0.001) in the proportion of respondents who had received surgery as a function of joint location, with respondents more likely to have received surgery to the knee joints than either the ankle or hip joints. Of all the respondents, 59 (32%) had been medically diagnosed with OA in at least one of the lower limb joints. Some 51% of players who reported that they had retired through a soccer related injury (71) were diagnosed with OA compared with 25% of players who did not retire through injury (92). There was a significant difference (p<0.001) in the numbers of respondents who had been medically diagnosed with OA as a function of joint types, with more respondents diagnosed with OA in knee joints than in ankle or hip joints. Eight respondents were diagnosed with OA in two different types of lower limb joint and two respondents were affected at all three types of lower limb joint. Of those respondents who identified their age, a non-significant greater proportion of the 70+ age group were diagnosed with OA compared with the other age categories (20–29 years, 0 (0%); 30–39 years, 14 (36%); 40–49 years, 21 (35%); 50–59 years, 9 (32%); 60–69 years, 8 (42%); ≥70 years, 6 (50%)). Table 3 shows the calculated DAR for each of the lower limb joints (hips, 0.3/100 000 hours; knees, 2.0/100 000 hours; ankles, 0.6/100 000 hours) based on the loading rates reported for training and competition. Table 4 gives the proportions of respondents with joint pain as a function of joint, activity, and whether or not the respondent had been medically diagnosed with OA. Significantly more respondents reported joint pain in at least one lower extremity joint during one or more daily activities than those who did not (joint pain, 137 (80%); no joint pain, 35 (20%); p<0.001). There were significant differences (p<0.01) in the numbers of respondents who reported at least a minor level of pain in daily activities, with more respondents reporting pain in the knee joints than in the ankle and hip joints, for both static and dynamic activities. Table 5 gives the weighted pain scores calculated for static and dynamic activities for each joint and all respondents. The response rate (37%) for the survey was comparable with those obtained from earlier postal surveys with English soccer clubs involving physiotherapists23 (40%), players24 (38%), and safety officers25 (40%). It was also comparable to employee response rates for postal surveys in other small and medium sized business studies.26 However, it should be noted that ex-players who had specifically suffered from OA and/or lower limb joint pain after their career may have been more likely to respond to the questionnaire. The major locations identified for career ending acute injuries were similar to those reported previously in English professional soccer by Windsor Insurance Brokers3 for the 1987/1988 to 1994/1995 seasons (knee, 49%; back, 17%; ankle, 13%). However, the present study indicated that ankle injuries were a bigger problem than that identified previously. A prospective injury audit within English professional soccer reported that the ankle (17%) and knee (14%) accounted for most non-career-ending injuries.4 The proportion of non-career-ending back injuries (7%) reported in this study4 represented a relatively small proportion of the acute injuries observed in English professional soccer compared with its significance as a career ending chronic injury. The observation by Fuller and Hawkins2 that a considerable proportion of players leave professional soccer because of chronic injury is supported by the result (27%) obtained in our study. The major locations identified for these career ending chronic injuries were the knee (37%), lower back (22%), and hip (9%). The high level of chronic injury in the lower back compared with the low level of acute injuries reported in prospective studies provided a cause for concern because it is possible that minor traumas experienced by players in this region were not serious enough to prevent players from training or playing and therefore were not recorded during the prospective study. The prevalence of medically diagnosed OA in the present sample of respondents (32%) was lower than that reported in another sample (49%) of former English professional soccer players.27 In addition, the level of OA among players who had retired through injury (51%) was twice that observed among players who had not retired through injury (25%). However, the present study was made up of players with a lower mean age (47.6 compared with 56.1 years) and a lower mean age at diagnosis of OA, for all joints (30.2 compared with 39.0 years). In the general male population, the prevalence of moderate or severe OA is less than 10% for the age range 35–44 years, and about 20% for the age range 45–54 years.28,29 In a Royal College of General Practitioners morbidity survey,30 the incidence of symptomatic OA for men in the 25–44 and 45–64 year age groups was 5% and 30% respectively over the period 1981–1982. Therefore it can be concluded that the prevalence of OA in retired professional soccer players is greater than that observed in the general population, particularly among those players retiring through injury. The major symptoms and consequences of joint OA are pain in soft tissue structures such as ligaments, tendon insertions and bursae, and this eventually leads to impaired joint function and pain.31 In the present study, 80% of respondents reported at least minor joint pain during at least one of the daily static and dynamic activities. In comparison, joint pain reported in other populations32 varied between 40% and 80%. The weighted joint pain scores were higher for dynamic activities than for static activities for all joints, and the scores for the knee joints were higher than for the hip and ankle joints. The proportion of respondents (37%) who reported pain in the knee joints was also greater than that for the other joints; this may be related to the greater number of acute injuries, surgical interventions, and instances of OA reported for the knee joints. The level of pain reported in the knee joints also tended to be higher than for the other joints. After surgical intervention, there tends to be a delay period before OA can be detected through clinical and radiographic measures,5 and the age at which surgery takes place also has an influence on the development of OA. In this study, the mean age at which surgery occurred was significantly lower for the ankle (26.4 years) and knee (28.0 years) joints than for the hip joints (37.5 years) by 10 years. Muckle36 reported that the average age for knee surgery in a group of 50 professional and 41 non-professional soccer players was 23.9 years and that each of these players was also diagnosed with OA within 10 years of surgery. Kujala et al16 and Raty et al17 provided a breakdown of lifetime weekly average exposures for endurance (1.1 hours), soccer specific (3.5 hours), and power training (0.1 hours) activities in elite Finnish soccer players. The average age of these players was 56.5 years at the time of the survey, which is nearly 10 years older than in our study. The higher levels of training recorded by respondents in the present study may account for the earlier age at which OA was diagnosed. Klunder et al8 have reported an exposure time in a sample of soccer players of 6.7 hours per week for 22.8 years. This sample of players had a greater prevalence of OA in the ankles (53% v 33%) and hips (49% v 26%), but not knees (14% v 12%), than a control group. Using the total exposure rates from respondents' replies, it was calculated that the DARs per 100 000 hours of exposure were greatest for the knee joints (2.0) followed by the ankles (0.6) and hips (0.3). A comparison of the DARs presented here with acute injury exposure rates presented by Hawkins and Fuller4 indicates that, on a probabilistic basis, one case of OA in a professional soccer player is likely to occur for every 390 acute injuries, or the equivalent of three Premier League players being diagnosed with OA every season. Cooper et al31 identified epidemiological evidence that professional soccer as an occupation contributes to the risk of OA at the hip and knee joints. However, the weight of evidence at present may not be sufficient to tip the balance in favour of compensation for players in this occupation.31 This supported the decision of the UK Industrial Injuries Scheme not to register professional soccer as an occupation under the Contributions and Benefits Act 1992. However, the present study has indicated that there is significant cause for concern over the level of OA found in retired professional soccer players compared with the general population and that the evidence indicates that a health surveillance programme would be highly desirable for professional soccer players. The objectives of this study were to investigate and describe the prevalence of OA and the level of pain reported in lower limb joints by retired English professional soccer players. Nearly half (47%) of all the players in the sample suffered career ending injuries. Of these, 42% retired because of an acute injury and 58% because of a chronic condition. In addition, 32% of all players had been medically diagnosed as suffering from OA in one of the lower limb joints. However, 80% of all players exhibited at least minor pain symptoms in at least one of the lower limb joints. There is sufficient evidence to warrant the implementation of further control measures including the introduction of health surveillance for professional soccer players as part of an overall risk management process. We would like to acknowledge the invaluable assistance provided by the Professional Footballers Association, in particular the help provided by George Berry and Lindsay Gallagher in administration of the players' database. SD acknowledges financial support from Loughborough University while undertaking part of the work described here. Fuller CW. Implications of health and safety legislation for the professional sportsperson. Br J Sports Med1995;29:5–9. Fuller CW, Hawkins RD. Developing a health surveillance strategy for professional footballers in compliance with UK health and safety legislation.Br J Sports Med1997;31:148–9. Windsor Insurance Brokers Limited. Investigation into career ending incidents to professional footballers in England and Wales, from 1987/88 to 1994/95. London: Windsor Insurance, 1997. Roos H. Are there long-term sequelae from soccer? In: Mandelbaum BR, Garrett WE, Kirkendall DT, eds. Clinics in sports medicine: soccer injuries. Philadelphia: WB Saunders Company, 1998:819–34..
Solonen KA. The joints of the lower extremities of football players. Ann Chir Gynaecol Fenn1966;55:176–80. Adams ID. Osteoarthritis and sport. J R Soc Med1979;72:185–7. Klunder KB, Rud B, Hansen J. Osteoarthritis of the hip and knee joint in retired football players. Acta Orthop Scand1980;57:925–7. Chantraine A. Knee joint in soccer players: osteoarthritis and axis deviation. Med Sci Sports Exerc1985;17:434–9. Neyret P, Donell ST, Dejour D, et al. Partial meniscectomy and anterior cruciate ligament rupture in soccer players. A study with a minimum 20-year followup. Am J Sports Med1993;21:455–60. Lindberg H, Roos H, Gardsell P. Prevalence of coxarthrosis in former soccer players: 286 players compared with matched controls. Acta Orthop Scand1993;64:165–7. Vingard E, Alfredsson L, Goldie I, Hogstedt C. Sports and ostoearthritis of the hip. Am J Sports Med1993;21:195–200. Kujala UM, Kaprio K, Sarna S. Osteoarthritis of weight bearing joints of lower limbs in former elite male athletes. BMJ1994;308:231–4. IIAC. Disorders of the knee. London: HMSO, 1995. Kujala UM, Kettunen J, Paananen H, et al. Knee osteoarthritis in former runners, soccer players, weight lifters, and shooters. Arthritis Rheum1995;38:539–46. Raty HP, Kujala UM, Videman T, et al. Lifetime musculoskeletal symptoms and injuries among former elite male athletes. Int J Sports Med1997;18:625–32. Lequesne MG, Samson M. Indices of severity in osteoarthritis for weight bearing joints. J Rheumatol1991;18(suppl 27):16–18. Reilly T, Howe T. Injury prevention and rehabilitation. In: Reilly T, ed. Science and soccer. London: E & FN Spon, 1996:151–64. Hodson A. Too much too soon? The risk of `overuse' injuries in young football players. SportCare Journal1994;1:19–24. McGregor JC, Rae A. A review of injuries to professional footballers in a Premier football team (1990–1993). Scot Med J1995;40:16–18. Drawer S, Fuller CW. Benchmarking the levels of injury support services available at English professional football clubs. European Journal for Sport Management1999;6:34–47. Hawkins RD, Fuller CW. A preliminary assessment of professional footballers' awareness of injury prevention strategies.Br J Sports Med1998;32:140–3. Fuller CW, Hawkins RD. Assessment of football grounds for player safety. Safety Science1997;27:115–28. Storey DJ. Understanding the small business sector. London: Routledge, 1994. Turner AP, Barlow JH, Heathcote-Elliott C. Long term impact of playing professional football in the United Kingdom. Br J Sports Med2000;34:332–7. Kellgren JH, Lawrence JS Osteoarthritis and disc degeneration in an urban population. Ann Rheum Dis1958;17:388–97. Lawrence JS, Bremner JM, Bier F. Osteoarthritis. Prevalence in the population and relationship between symptoms and X-ray changes. Ann Rheum Dis1966;25:1–24. Royal College of General Practitioners. Morbidity statistics from general practice. 3rd National Morbidity Survey 1981–2. London: HMSO, 1988.
Cooper C, Campbell L, Byng P, et al. Occupational activity and the risk of hip osteoarthritis. Ann Rheum Dis1996;55:680–2. Spector TD, Hart DJ. How serious is knee osteoarthritis? Ann Rheum Dis1992;51:1105–6. Jackson JP. Degenerative changes in the knee after meniscectomy. BMJ1968;2:525–7. Jacobsen K. Osteoarthritis following insufficiency of the cruciate ligaments in man. Acta Orthop Scand1977;48:520–6. Larson M, Pearl AJ, Jaffet R, et al. Soccer. In: Caine DJ, Caine CG, Lindner KJ, eds. 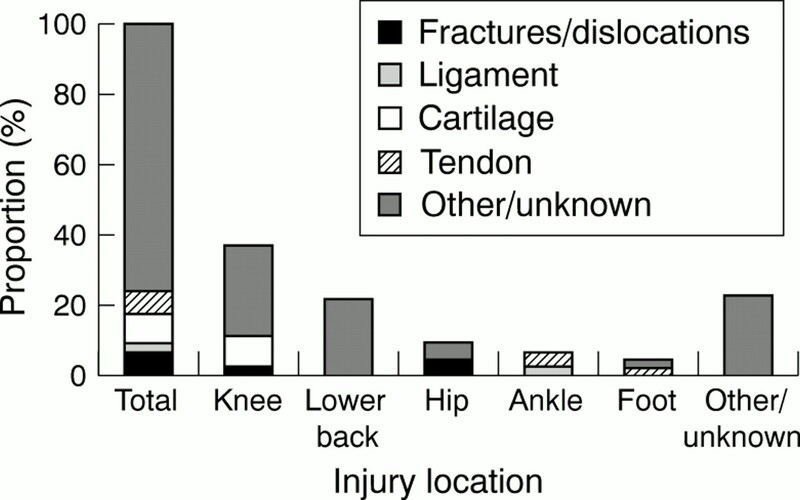 Epidemiology of sports injuries. Champaign, IL: Human Kinetics, 1996:387–98. Muckle DS. Factors affecting the prognosis of meniscectomy in soccer players. Br J Sports Med1983;17:88–90. Neyret P, Donell ST, Dejour H. Osteoarthritis of the knee following meniscectomy. Br J Rheumatol1994;33:267–8. Boszotto H, Helperstorfer W, Kolndorder G. Long-term results of arthroscopic meniscectomy. Aktuelle Traumatol1994;24:30–4. Altman R, Asch E, Bloch D, et al. Development of criteria for the classification and reporting of osteoarthritis. Arthritis Rheum1986;29:1039–49.